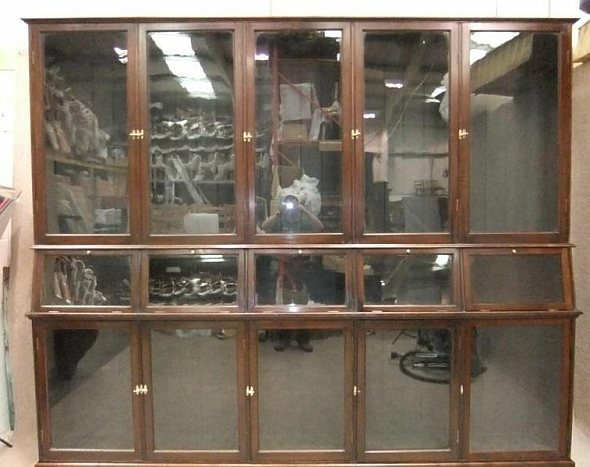 A truly magnificent, circa 1900, mahogany antique shop display unit / large display cabinet. Featuring five glazed doors to top which are fitted with brass t-bar handles, and open up to reveal a fully adjustable shelving system. This piece is an ideal piece of furniture that can be used as a superb shop display, personal collections. This section sits upon five smaller drop down glazed cupboards with a removable internal shelf. This piece is completed with a further five glazed doors to base, with a matching adjustable shelving system. This antique shop display is supplied with twenty eight (28) shelves, and all of the locating pegs. It splits into two sections for ease of transportation and reassembly, and is in excellent condition for a piece of this age. Due to it being used on a daily basis, unfortunately there are two t-bar handles missing from the base section. We believe that it will not be difficult to source replacement handles. This is a truly rare and outstanding piece of quality mahogany furniture. DELIVERY - £250.00 to England and Wales. For deliveries outside of this area, please contact us for a quote. If you like our antique shop display, you will love our full range of antique furniture. Click here to view.